Travel to one of the most exciting winter destinations – the Vuokatti resort in Finland to take full advantage of thrilling winter activities. The fun and excitement of a husky safari in winter wonderland is easily accessible after just a short flight from Helsinki. On this tour you will drive a traditional 2-seat sled, have a magical experience on night safari in a fairy-tale winter forest with frozen lakes, hopefully see the northern lights and continue you winter adventure in the day light to discover the astonishing beauty of Finnish nature. Are you up for more winter fun? Then try skiing on 150 km of various slopes, cross country skiing, snowshoe walking, snowmobile safari, skating, sauna paradise and other exciting winter activities offered in the Vuokatti resort. Only 5 days of the short holiday break will bring so much that you will never forget your winter adventure in Finland! Upon arrival to Kajaani airport you will be transferred to your hotel in Vuokatti resort. There is no need to travel far away to the north to experience a real Finnish winter and try all sorts of winter activities. Vuokatti is a great and relatively accessible destination offering thrilling winter activities to all adventure travellers: ski slopes of all levels, world’s first snowboard and skiing tunnel, snowshoe trekking in winter wonderland, reindeer, snowmobiles… and of course the ultimate winter adventure – a husky safari. After the flight you can relax like Finns do – go to the famous Finnish sauna, have a shot of Finnish vodka and join us for the welcome dinner in one of the cosy restaurants. This morning you will wake up excited to start your winter adventure. 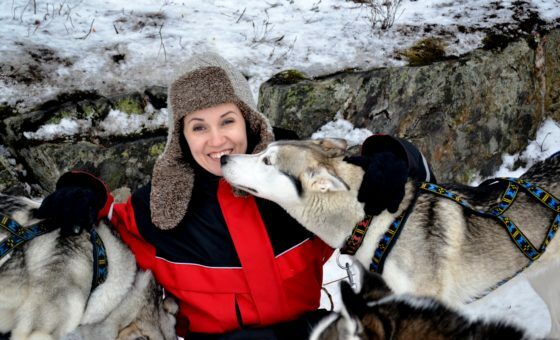 In the local husky kennels you will meet a professional musher who will teach you the basics of driving a traditional 2 person sled and let you practice on a short trail. You can start as a driver leading the dog and controlling the brakes to ensure everything goes smoothly and later swap the roles with your partner to become a passenger simply enjoying the peaceful motion and beautiful winter scenery. After some rest you continue with a night safari, a magical experience when powerful headlights cut through the darkness of the winter forest, onto frozen lakes, and on a clear night the heavens open up before your eyes hopefully offering up the spectacular sight of the northern lights. Relax by the warmth of the fire in our traditional Mongolian Yurt as your guide serves up a traditional “musher’s burger”, then step outside for another spectacular view of the night sky. 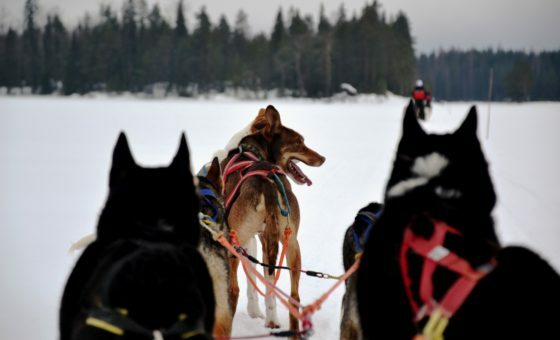 In the morning meet the dogs and continue your winter adventure in the daylight. The more you get to know huskies the more you discover how amazingly friendly they are. Huskies are made to run and enjoy it as nobody else does and soon you will have as much fun and passion about running in the magical winter forest as they do. Today you will be travelling in less travelled areas and immersed in the fairytale scenery of the taiga forests and peaceful beauty of the frozen lakes… It is a true discovery of Finnish nature! En route stop for some hot food and drink and relax by the fire in the traditional Mongolian yurt. 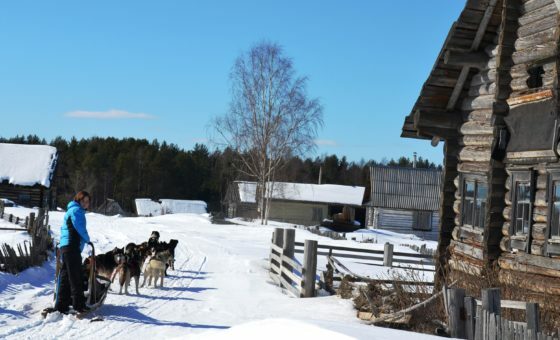 Today you have a free day to try some other winter activities offered in Vuokatti. Are you up for skiing? Take advantage of 150 km of various trails and tracks for freestyle skiing. Here you can ski at night (about 32 km are illuminated) or go to Vuokatti Ski Tunnel that is open all year round. Would you prefer to go for a walk in the white forest and climb one of the hills to enjoy a view of winter wonderland? Choose a snowshoe walk that can be a relaxing activity allowing you to admire winter scenery, or a challenging workout that will raise your pulse. The thrill of driving snowmobiles on 250 km of snowmobile routes, cross-country skiing, skating and other exciting winter activities are there to make this day perfect! Your tour ends today. We offer an optional transfer to Kajaani airport.